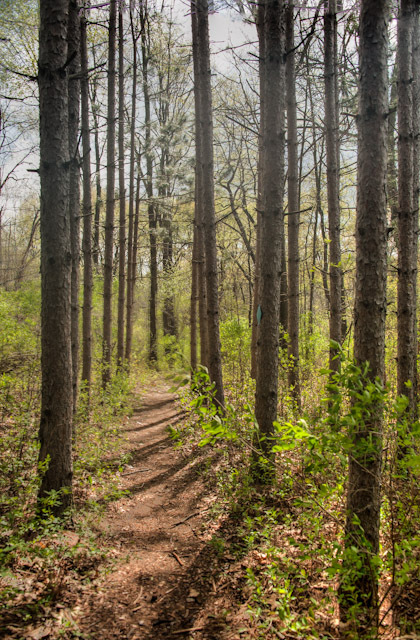 Located in the city of Fenton, Dauner Martin Nature Sanctuary is the perfect getaway for those looking to conveniently get into the outdoors. One of just five MNA nature sanctuaries located in a city, this 155-acre piece of land was originally purchased by Phillip Dauner in 1863 to grow hops for his local brewery. The property was passed down to his great grandchildren Robert and Marion Martin, who donated it to the MNA in 1998 to ensure its protection forever. Today, the sanctuary offers nearly 4.5 miles of trails for visitors to experience its varied natural terrain. Updated in 2010, the extensive trail system is diamond-marked for easy navigation and has several boardwalks over wetter areas. Much of the sanctuary consists of large pine groves interwoven among hardwood forests. 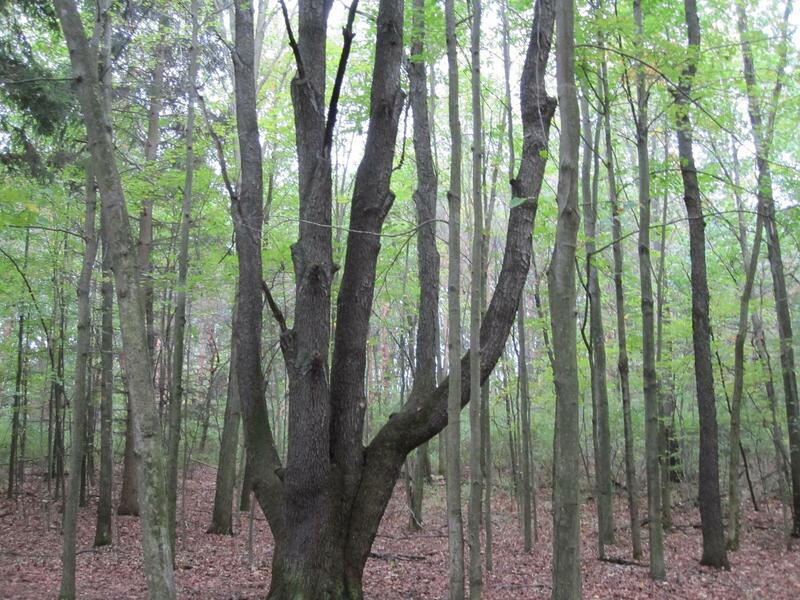 After inheriting the land from his great grandfather Phillip, Robert Dauner spent years planting the pine stands in an effort to restore the natural habitat. Visitors can enjoy these plantations, along with 40 other native tree species along the sanctuary’s eight different trails. Oak, elm, ash, and cherry trees are just a few of Dauner Martin’s hardwoods that attract various bird species like the blue-winged warbler. Below the majestic trees, guests can enjoy plant life such as the tall sunflower and highbush cranberry—native plant species that are thriving amidst a variety of several invasive species. 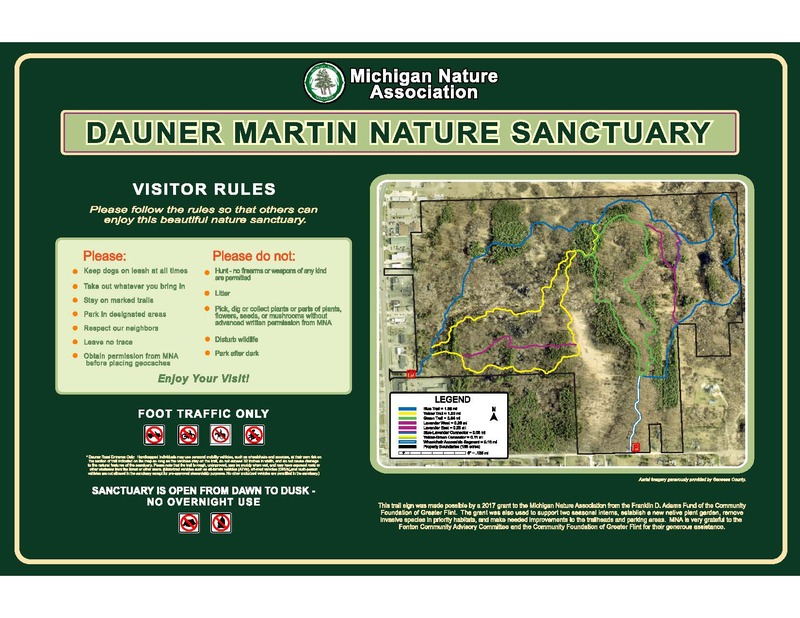 Visitors will be taken by the beauty and solitude of Dauner Martin Nature Sanctuary and its stark contrast to the nearby urban areas. The boardwalks installed throughout the trail system at Dauner Martin are for both the convenience of visitors and the protection of the habitat found within the sanctuary. 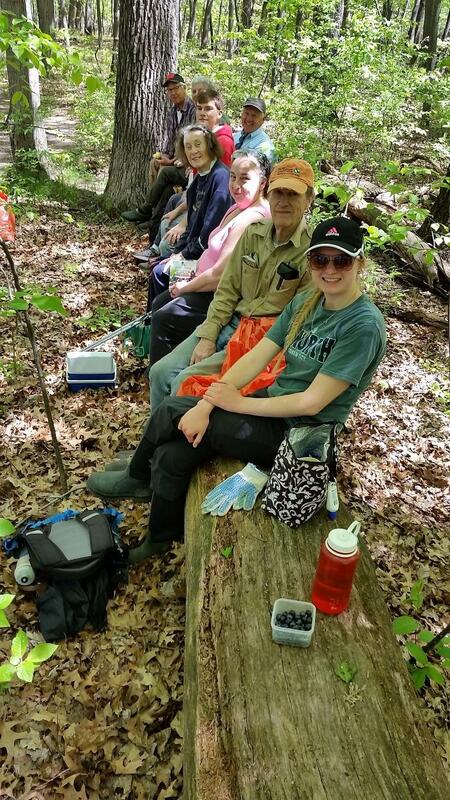 Forested wetlands experience fluctuating water levels during the year, usually seeing increases in water level in winter and spring followed by lower levels in summer and fall seasons. Fluctuating water levels facilitate seed germination and reduce competition from many woody plants. The sanctuary is located in Genessee County, between Leroy and Dauner Roads. The sanctuary has two parking areas: the paved road on N. Leroy Street near VG’s, north of Dauner Road, and on Dauner Road 0.4 miles east of N. Leroy.